→Red Copper Pan Reviews : Is This Nonstick Cooking Pan Worth Buying? Red Copper Pan is a copper infused pan having ceramic cooking surface which help you to cook healthier meals without oil, butter, or grease. You also do not have to worry about the scratches, because Red Copper Pan As seen on Tv claims that the product is 100% scratch proof. Read our detailed red copper pan reviews 2019 to understand more about this product. It’s ultra-tough durability, PFOA, and PTFE-free non-stick surface. Its scratch resistance feature and the healthier cooking mechanism makes this product more favorite and versatile. As per its official website “redcopperpan review” Following are its incredible feature. Before going to discuss its health benefits, you should know that copper is not a perfect cooking material because acidic foods can react with the copper material and can lead some health issues. But despite this, Red Copper Pan is highly durable and comes with the non-stick ceramic surface that can help you to cook using very less oil, butter, and grease, which will improve your health. But if you want to add these ingredients(oil, butter, and grease) to your food when preparing it You can use them. Red Copper Pan is one of those pans which is currently hitting the market. The pan’s highlighted features are its non-stick surface and copper ceramic body. Unlike other nonstick pans, this pan’s surface is claimed to be PFOA and PTFE free, and it is also said that the product is scratch proof. It is oven safe can withstand the temperature of up to 500 degrees. The advantage of cooking with copper is that it is an excellent heat conductor. This allows controlling temperature more precisely. The copper cookware is very light weighted so it is very easy to handle it. Copper cookware is aesthetically attractive part of any kitchen decor. Red Copper Pan As seen on Tv is not similar to a traditional copper pan. The bottom of the pan does not appear to be made of copper, only the inner cooking surface is made up of copper. This is why the pan is claimed to be dishwasher safe. You can also read our Perfect Cooker Reviews2018 and cooks food very quickly. Red Copper Pan got mixed reviews from its users. But I’m a fan of the Red Copper pans. It is working than better than any pans I’ve tried till now, food does not stick. they don’t get scratch and also dishwasher safe. It will be really interesting to see the durability of the pan. If you are also using this pan please do share your experience in our comment section. 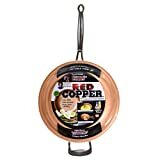 I hope our Red Copper Pan Reviews 2019 will help you to understand more about this product. If you want to know more about this product check customer’s Red Copper Pan reviews on Amazon. You can use Red Copper Pan for cooking anything. The product is efficient and also safe for healthy cooking. The price of the product is bit high, but apart from that product is really worth buying.